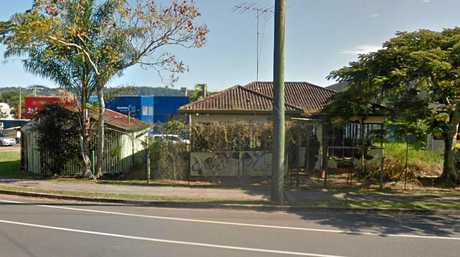 HORROR HOUSE: Nearby residents of this Carter Rd, Nambour house are "fed up" with the dilapidated property. (inset) Rubbish and furniture around the back of the home. 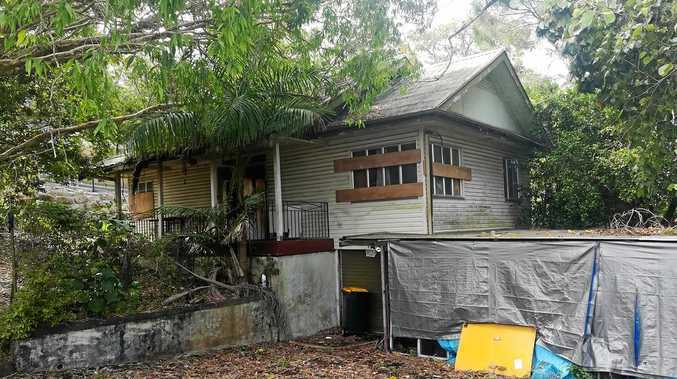 RESIDENTS are living in fear of what has been dubbed Nambour's "haunted house", and another dilapidated, potentially asbestos-riddled home remains exposed. Two abandoned buildings have come to the Sunshine Coast Council's attention after community members made complaints about 24 Perwillowen Rd, Nambour and 78 Carter Rd, Burnside. Photos of the dilapidated Carter Rd property surfaced on social media which reveal the disaster area behind the boarded-up, tarp-covered street frontage. Images show trashed furniture and rubbish packed to the ceiling inside and underneath the home, smashed windows and a yard full of debris including broken furniture, wire and trash. One very concerned nearby resident who wished to remain unnamed said the neighbourhood was "over it" and people were often spotted "sleeping rough" in the home. He said crime had spiked in the area and people believed to be on drugs were often seen going into and squatting at the address. He said he was aware of a number of neighbour's homes being broken into, and his own vehicle had become the victim of a break in recently. "It's quite annoying that I have to worry about leaving the house with nobody in it let alone when we are asleep in our beds," he said. The Carter Rd home was last sold to its current owners in 1999 for $105,000, but they were unable to be contacted for comment. The other home on Perwillowen Rd, Burnside neighbours businesses and is perched along a footpath often used by school students. Broken, graffitied walls reveal rubbish and smashed glass within the building, and the yard is overgrown to the borders of the property. A council spokeswoman said a complaint had been made about the building's visual amenity and overgrown vegetation of the property, and the presence of asbestos. "Council officers issued compliance notices and the owner has abided by the notices to tidy up and fence the property," the spokeswoman said. Further clarification was sought on the presence of asbestos, however council is yet to respond. The spokeswoman said there were no current complaints regarding the Perwillowen Rd house. "Council has received complaints in the past with regards to the visual amenity of the property and compliance notices were issued to the owner," the spokeswoman said. "The owner has abided by each compliance notice." The home was last sold in June 2003 for $150,000. The council spokeswoman said public health and safety concerns could be made to council on 5475 7272, and officers would investigate. Laws relating to dangerous and dilapidated buildings can be found in Section 248 and 249 of the Queensland Building Act. Any person who would like to report a dangerous or dilapidated building should contact council, who investigates all complaints or reports to determine the level of risk to a person and/or property. (d) to demolish or remove the building or structure - only if council reasonably believes it is not possible and practical to take steps to comply with (a) to (d) above.